Back in the 1990s, the internet was still this wild and woolly space where there was a lot of promise but no one really knew what the hell they were doing. At the time, Marvel still considered themselves a comic book company and their first forays into internetting remained focused on that. One such attempt was a digital weekly newsletter sent to subscribers via email. It was, not surprisingly, mostly promotional in nature highlighting what issues were hitting the stands and upcoming storylines and such. 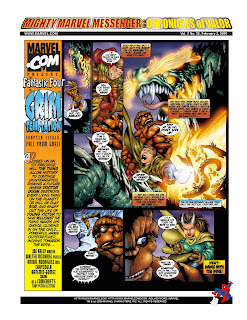 After several weeks, Marvel decided that they could include actual comics in the newsletter as well. But rather than rehash old material, they hired Joe Kelly and Walter McDaniel to craft entirely new stories. These were serialized over the weeks, one page at a time. And, while Kelly and McDaniel worked in a standard pamphlet comic format (possibly so that it could be printed later -- although that never happened) the pages themselves were formatted to 8.5" x 11" so readers could print them off on their home printers more readily. Hence, there's a fair amount of filler on each page. The first story launched, as I said, a few weeks into the newsletter's run and ran for twelve installments with the last one being a two-page, horizontally formatted conclusion. "The Quest for the Eleventh Ring" featured the Fantastic Four battling the Mandarin. The last story finished about a year later, and ran for fifteen installments. It diverged significantly from established continuity in a number of ways, not the least of which being some radical changes to Dr. Doom, his mother, and their relationship. The story was mostly centered around the Thing and was called "Grim Temptation." Despite the experiment running for about a year, Marvel obviously wasn't seeing much benefit from it. Particularly with the cost of new comics that had no direct means of seeing any ROI. It was an interesting experiment, particularly for a large corporation like Marvel, but it ultimately proved financially unsuccessful. Another enjoyable post - thanks Sean! It was a promotion for Hewlett Packard, who were pushing their direct to printer offering and needed attractive content, so they worked out a deal with Marvel. It was profitable as long as that deal lasted.